Brooklyn, NY - Presenting new works by Jennifer Williams and Jason Varone, Another Landscape Show features work operating outside the canon of the traditional landscape. Working with imagery and media that investigate the underlying anatomy of a landscape, Williams and Varone emphasize the engagements, interactions and the culture of change that naturally take place in a landscape; revealing these to be more indicative of a place's identity than its formal structure. As a means of understanding the fundamental makeup of a place, Williams and Varone each combine traditional techniques with new media in innovative ways: utilizing large-scale photography, collage, Twitter feeds and various digital processes. Each resulting work provides a unique exploration of the evolving relationships between a place, its essence and its ideal. Jennifer Williams holds an MFA from Goldsmiths College in London and a BFA from The Cooper Union in New York City. Notable recent shows include: The Hunterdon Art Museum, Pittsburgh Center for the Arts, A.I.R. Gallery, Muriel Guépin Gallery, La Mama Gallery, The West Collection, and Brown University. She is a former 2011-2013 Center for Emerging Visual Artists Fellow, 2008-2009 A.I.R. Gallery Fellow, as well as a 2009 Visual Studies Workshop and 2011 NARS Foundation International Artist Residency Program resident. Her work has been featured in the Site95 Journal, The New Yorker Photo Blog, Afterimage Magazine, Excerpt Magazine, Photographic Quarterly, and the book "A Stuck Up Piece of Crap: A Selected History of Stickers" (Rizzoli). Upcoming exhibitions include: Urbicide, Workshop Arte Contemporanea, Venice, Italy, and "Parallax Views" at the San Jose Institute for Contemporary Art. She was recently selected to participate in the Emerge program at Aljira Center for Contemporary Art. Williams currently teaches at The Cooper Union and City College CUNY in New York City. "My site-responsive projects are populated with recurrent structural systems evident on a macro and micro level. 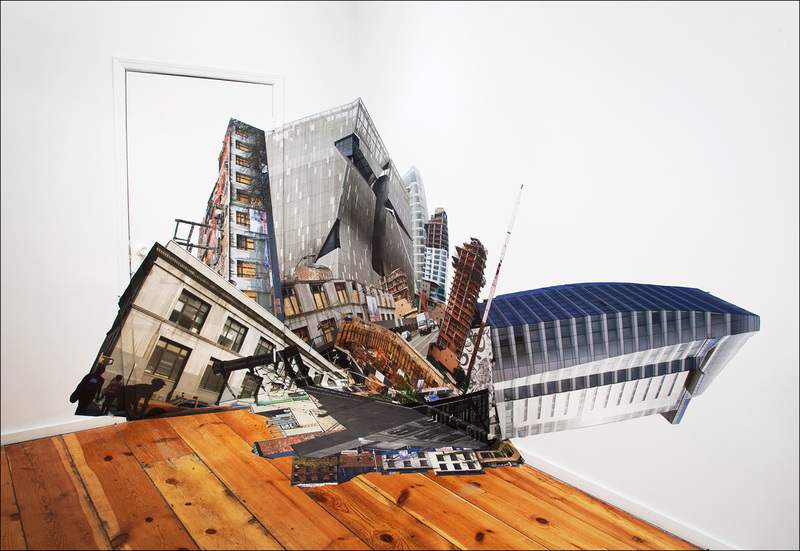 I use self-generated photographic imagery as found objects in the construction of two and three-dimensional large-scale collages. By activating transitory, passive, and seemingly negative space, my installations allow the photographic subject to interact with structural idiosyncrasies and social context within an exhibition space. I use photography not as a tool to stop time, but to create a semblance of controlling the passing of time. Presenting an unembellished representation of an object, the work is removed from much of the rhetoric associated with photography, allowing it to engage in a cross-disciplinary dialogue. My work engages traditional photographic languages while simultaneously questioning the ability of photography to accurately represent truth, exploiting photography’s ability to represent what is both true and what is false simultaneously." Jason Varone is a graduate of New York University. Varone's artwork has been exhibited in many venues including the Los Angeles County Museum of Art, The Boston Center for the Arts, The British Film Institute, The International Center of Photography, Art in General, and Hendershot Gallery in New York City. He currently works as an artist assistant to Peter Campus, a seminal figure in the history of electronic media art. technological advances and imminent decline from lack of natural resources. He combines video and painting with appropriated news footage and electronic data, removing any distinctions or boundaries between them. 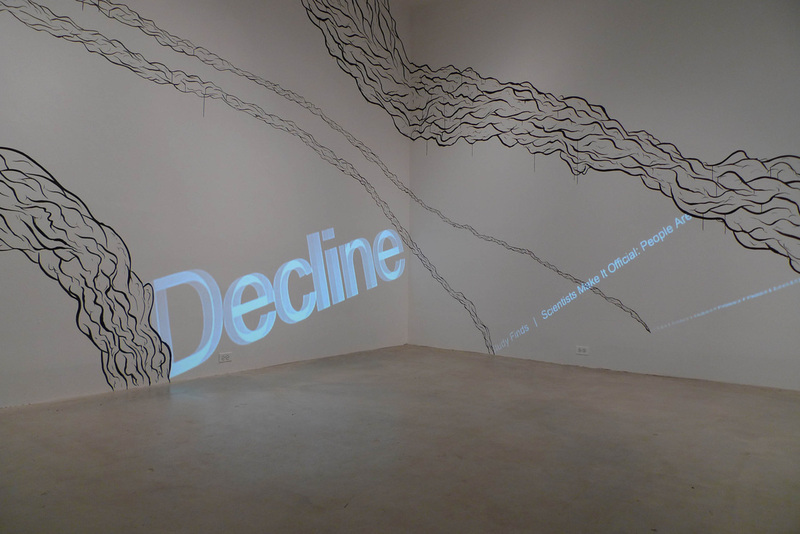 His "videopaintings" underline the impermanence and constant bombardment of transmitted information to a society that is fixated on alternately obsessing over or ignoring electronic messages. rooted in landscape painting. My installations exhibit a dialectic of materiality and an illusory experience that results from combining technology with traditional materials. I use hundreds of clips of appropriated video and digital content gleaned from the internet as elements to combine and collage, then project these displaced images onto objects or paintings. This process is analogous to how our shared landscape is besieged by technology, and the content of my projections concern important political events, history, and scientific exploration. My experiences with technology have informed my relationship to the natural landscape, and by extension to painting. I treat the landscape not as something you look at, and then, depict in a painting, but rather as something that can only be defined by the data flowing through it." Peter Gynd is an independent curator focusing engaging and culturally relevant work. 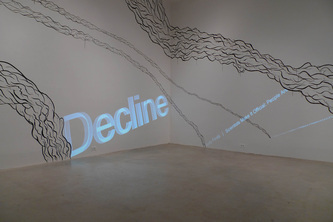 A graduate of the Alberta College of Art and Design, Gynd's past exhibitions include Many Conversations at Present Company (Brooklyn NY), Of Mind Body and Soul: An Exploration of the Personal at Fowler Arts (Brooklyn NY), and The Crit Show at the Dynamo Arts Association, Vancouver Canada. Gynd is also a co-producer of the Northside Arts Festival. The 440 Gallery is located at 440 Sixth Avenue in Park Slope, Brooklyn, between 9th and 10th Streets, and is convenient to the F, G, and R subways. The gallery is open on Thursday and Friday, 4-7 pm, and Saturday and Sunday, 11 am - 7 pm, or by appointment.